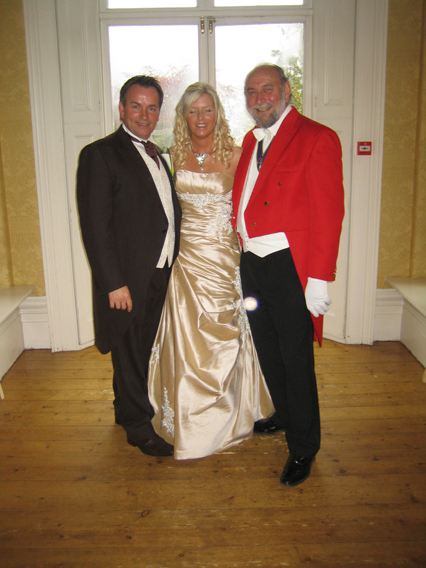 Gerry was fantastic at our wedding. He did exactly as he sets out to do. 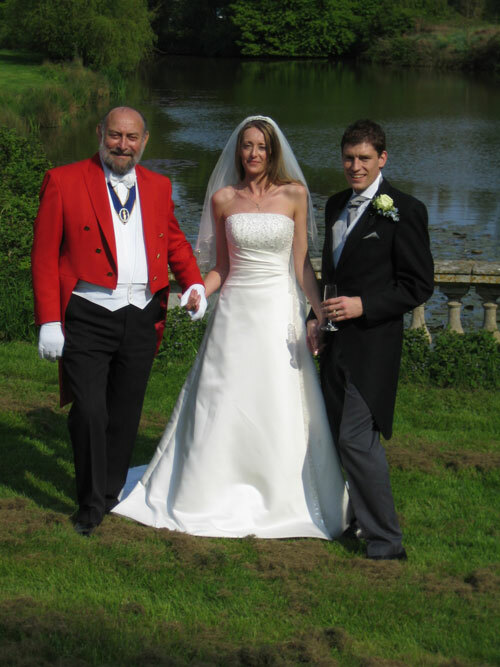 He ensured everything kept running, ironed out any minor problems introduced the bridal party to the guests in style and ensured that the parents, best man, bridesmaids and bride and groom were given a very warm and progressively warmer reception. 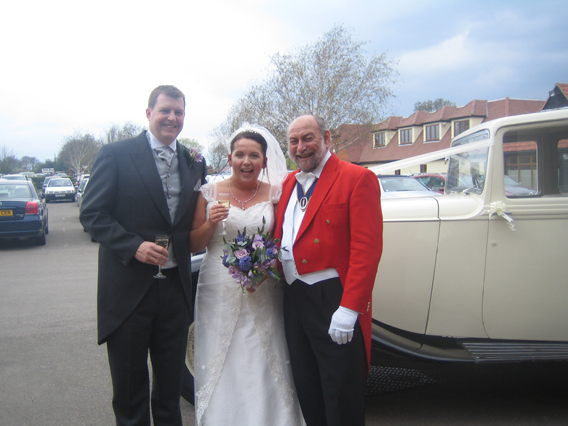 This culminated in a very noisy standing ovation for the bride and groom. 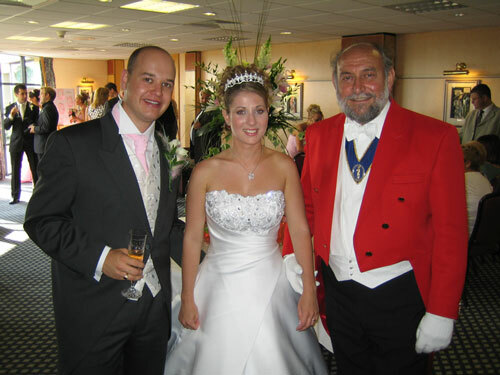 I am ever so glad we bumped into him in a wedding fayre as we hadn’t considered a toastmaster till then. 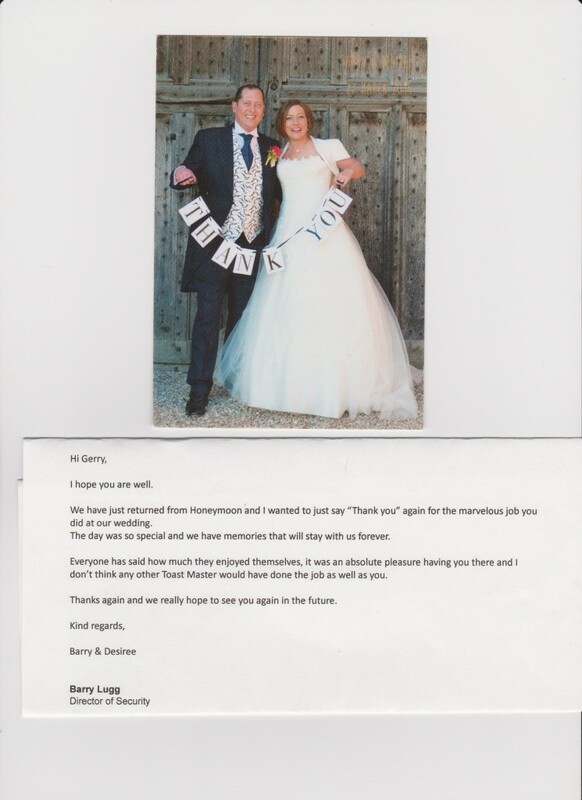 I am glad he was part of our wedding day…..thank you Gerry. Just a little note to thank you for Sunday. I think you saved the day and I don’t know what we would have done without you. I do hope you didn’t find us too difficult or demanding. You wouldn’t think with all the meticulous planning for eighteen months so much could go wrong in half an hour but I guess you have seen it all before and much worse. It all turned out well in the end. 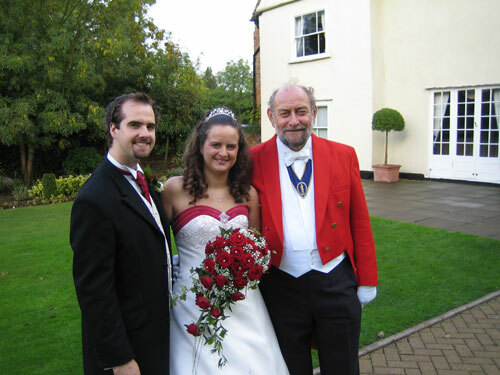 The flood subsided, the bride finally arrived, the music eventually played, my brother-in-law recovered and is fine (thank goodness), my little nephews were just stars, they were so well behaved, the sun came out and Dave got the pictures – 1500! You did a fantastic job and I think we would have to say it was a perfect day despite the hiccups, and plenty to laugh about in the future. Thank you very very much and with kindest regards. 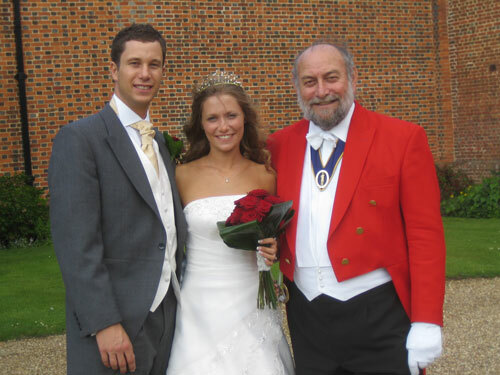 My son and daughter-in-law could not have chosen a better person to the toastmaster at their wedding. 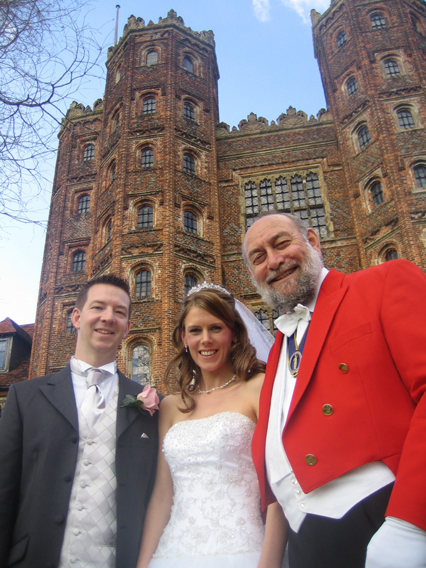 Gerry is a very friendly person and a first class toastmaster. 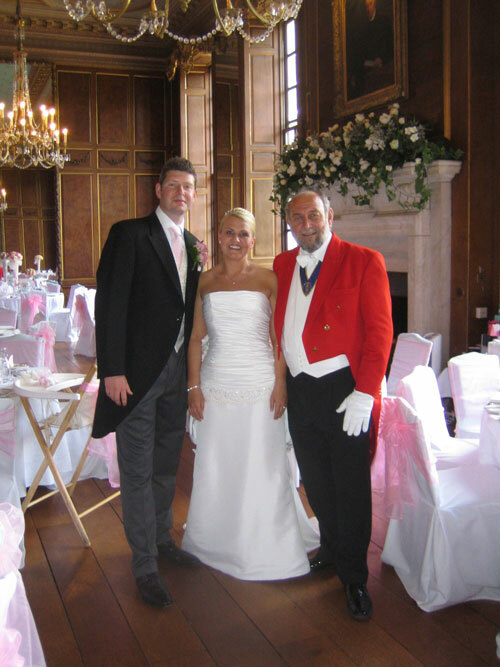 His ability to manage the day for us ensuring all our guests’ needs were catered for exceeded our expectations. 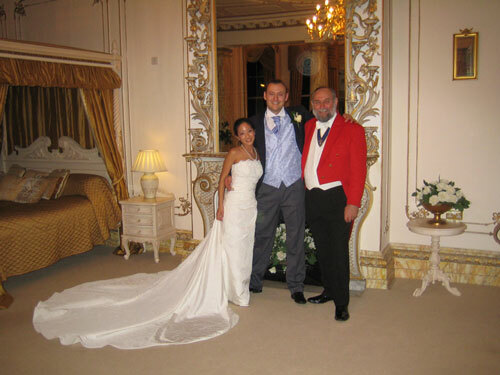 Gerry greeted all the guests on their arrival and knew just when to be on hand to give help or advice throughout the day. 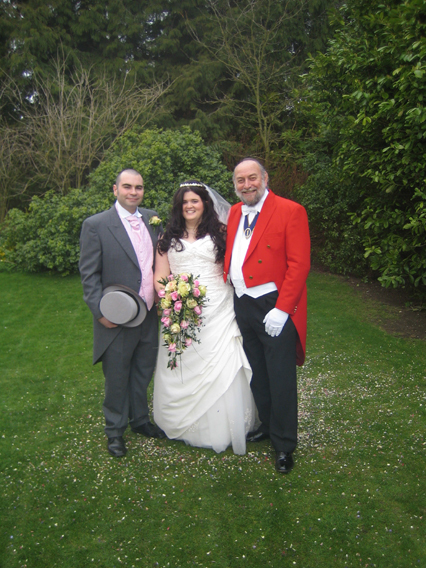 He even managed some great snap shots with my camera while I was in the more formal photographs. 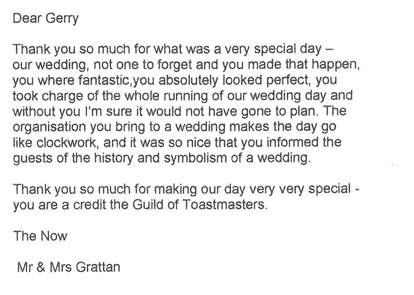 I would thoroughly recommend Gerry Tovell as a toastmaster. 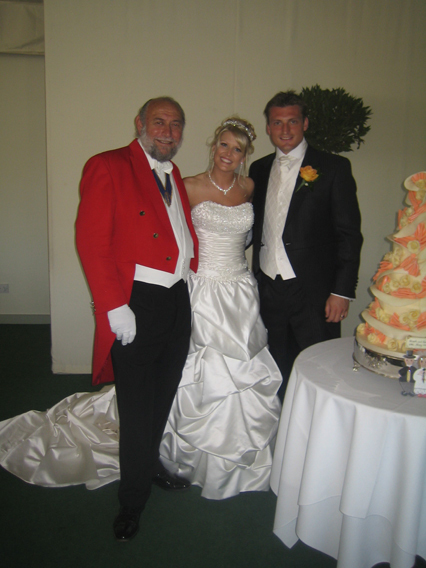 I just wish to thank you for being such a fine toastmaster on our daughter’s special day. 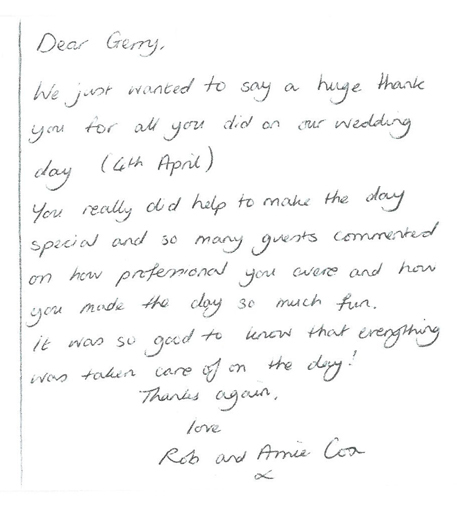 You really made us feel at ease by just being there, and you mixed so well with the guests that some of the groom’s friends thought you were part of our family. I only wish I had the confidence of finding something as rewarding because I would retire tomorrow. You will certainly hear from me again when and if my other two children ever decide to marry. We wanted to thank you for making our day run with such precision. 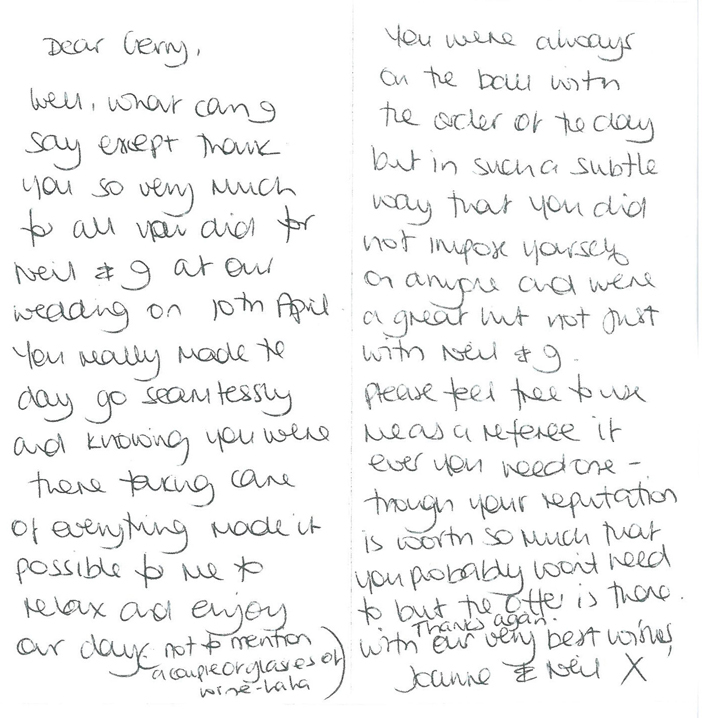 We had fun on the day and you made it a lot easier for us to relax without worrying what we should be doing next. You made everything run smoothly and for that we are very grateful. 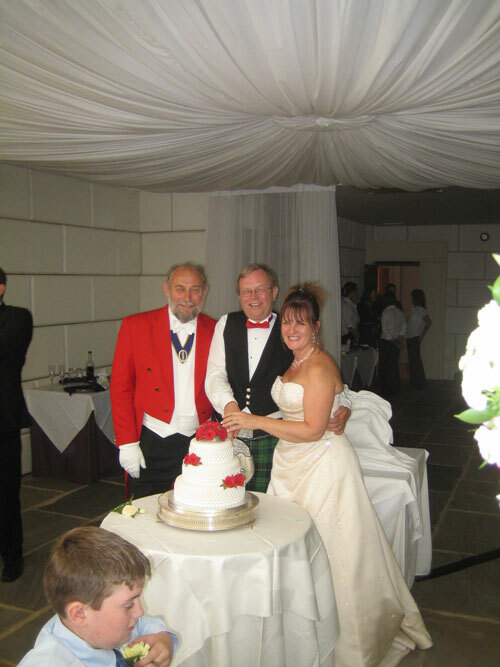 The stories about the wedding cake and the knife were very good and very well received. The forfeit for the mobile phone use was such a good idea and after that one song no-one used their phone again! Which in this day and age is very rare! 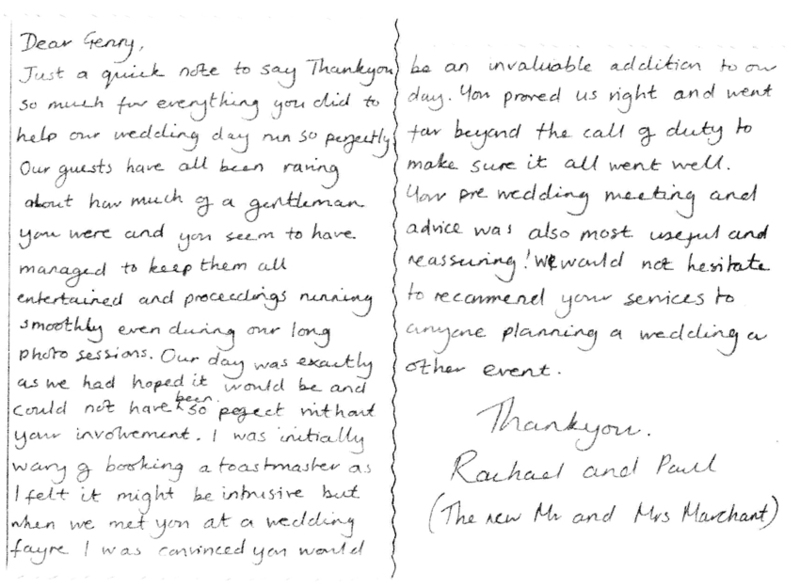 We would certainly recommend you to any one that asked and once again many, many thanks.